Werder Bremen passed up an opportunity to pull free of the relegation battle as they were pegged back by two late1899 Hoffenheim goals at the Weserstadion. Thomas Schaaf’s men, without a win since beating Stuttgart on Matchday 21, were ahead just two minutes into the game as Aaron Hunt stroked home a penalty after Hoffenheim’s David Abrahamhad fouled Nils Petersen. And it was not long before they found themselves two goals to the good, Kevin De Bruyne sweeping home Petersen’s cross with aplomb. For much of the second half, the hosts kept Hoffenheim at bay with relative ease and keeper Sebastian Mielitz was rarely called into action. The nerves began to fray, however, when substitute Sven Schipplock pulled a goal back with five minutes remaining, and the Hoffenheim turnaround was completed in stoppage time as Schipplock tapped in his second. It was a hammer blow for Bremen, who are now just three points clear of 16th-placed FC Augsburg in the relegation play-off spot. For Hoffenheim, however, this could yet prove a priceless point in their bid to avoid the drop. Hannover 96 and 1. FSV Mainz 05 played out an entertaining 2-2 draw in the AWD Arena, but it was a result that did very little for the two clubs’ respective European aspirations. Both sides still had lingering hopes of qualifying for the UEFA Europa League going into the game and it was Mainz who dominated the first half. Nicolai Müller’s excellent solo goal put the visitors into a deserved lead, but they were pegged back before the interval as Artur Sobiech rose to head home Jan Schlaudraff’s deep cross. Hannover’s day got a whole lot more difficult after the break when Christian Schulz was sent off for a second bookable offence, but they maintained their discipline and took the lead soon afterwards, Mame Diouf racing clear to slot home. Mainz were not done yet though and Müller grabbed his own second of the game, collecting Shawn Parker’s pass to fire past Rob-Robert Zieler. The draw keeps Thomas Tuchel’s men five points off the last European spot, while Hannover are four points adrift, each with two games left to play. 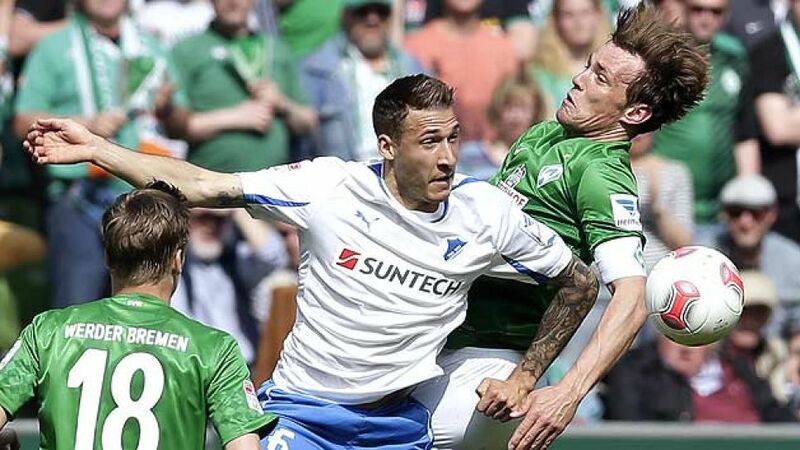 Relegated Greuther Fürth recorded only their fourth win of the campaign and the first by more than a single goal in the Bundesliga with a surprise 2-0 success away to ten-man VfB Stuttgart. A one-sided first half came to life in the 18th minute when Shinji Okazaki met Alexandru Maxim’s come-and-get-me cross and planted a header just past the post. Stuttgart were by far the more adventurous of the two sides, with Ibrahima Traore rifling an 18-yard effort against the woodwork and Wolfgang Hesl saving from Martin Harnik shortly before half time. However, the hosts were made to pay for not making more of their chances as Fürth took a shock 51st-minute lead. Edgar Prib stole a march on Gotoku Sakai who, in his attempt to wrestle back possession, only succeeded in diverting the ball into this own net. Stuttgart's task was made a whole lot harder when Antonio Rüdiger was shown a needless red card with 16 minutes left on the clock, but Prib was unable to beat Sven Ulreich from the spot. The Stuttgart stopper was helpless to prevent Furth ramming home their man advantage, though, as Ilir Azemi delivered the knockout blow two minutes from time. Eintracht Frankfurt maintained their push for a place in Europe with a routine 3-1 win over struggling Fortuna Düsseldorf. Japanese midfielder Genki Omae saw plenty of the ball early on for Norbert Meier’s men, but it was at the other end where most of the action was taking place. Alexander Meier twice spurned presentable opportunities, before making it a case of third time lucky on the half-hour mark with his 14th Bundesliga goal of the campaign. The better side by a mile, the Eagles needed just five minutes to extend their lead after the restart. Takashi Inui did the hard work, with Srdan Lakic rising highest to plant a firm header beyond the reach of Fortuna goalkeeper Fabian Giefer and into the net. Supersub Dani Schahin stepped off the bench to reduce the arrears, but it was Eintracht's Meier who would have the last laugh, making it a personal double for the fourth time this season to leave Fortuna hovering precariously above the bottom three on goal difference and Frankfurt hot on the heels of FC Schalke 04 in fifth.